DUBAI, United Arab Emirates (CNN) -- Dubai has forgiven the nearly $7 billion Baghdad owes it, Iraqi Prime Minister Nuri al-Maliki announced Sunday. 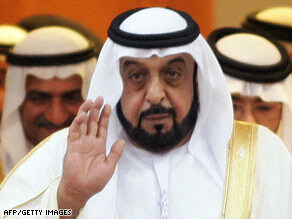 UAE President Sheikh Khalifa bin Zayed Al Nahyan has promised to appoint an ambassador to Iraq. UAE President Sheikh Khalifa bin Zayed Al Nahyan promised to "put out these debts," appoint an ambassador to Baghdad, and "help Iraq building the holy shrines that were targeted by the terrorists," al-Maliki said in a written statement. Al-Maliki and the sheikh met Sunday, the first day of a two-day official visit. Al-Maliki was accompanied by the Iraqi ministers of Interior, Commerce and Industry. "Our biggest challenge is now the reconstruction and rehabilitation of the economic situation and to provide services to our citizens," al-Maliki said. Debt relief is a major issue for Iraq, and the United States has urged other nations to forgive Iraqi debt, most of which is held by Arab states, U.S. Deputy Treasury Secretary Robert Kimmitt said in late May. Also, the UAE Cabinet on Sunday nominated Abdullah Ibrahim al-Shehhi to be the country's ambassador to Iraq. Al-Shehhi, who previously served as the Emirates' ambassador to India, is to travel to Iraq after his nomination is confirmed. An official government source said the UAE intends to reopen its embassy in Baghdad by the end of the year. The United States and other nations have urged Arab countries to post ambassadors to Iraq, reopen embassies and forge closer relationships with Iraq's government. The UAE mission in Iraq hasn't been active since a UAE diplomat was kidnapped and released two years ago. The year before that, two Iraqis working for that mission were killed. No ambassador from an Arab country has been stationed permanently in Iraq since July 2005, when Egypt's ambassador, Dr. Ihab al-Sherif, was abducted from a Baghdad street and slain. Al Qaeda claimed responsibility for the assassination, saying it had killed al-Sherif because of Egypt's foreign policies and its alliances with the United States and Israel. The UAE's announcement Sunday came a month after its foreign minister, Sheikh Abdullah bin Zayed al-Nahyan, visited Baghdad. During that visit, al-Nahyan extended the official invitation that brought al-Maliki to Dubai. Iraq's government said that al-Nahyan's one-day visit was the first to Iraq by a Gulf Cooperation Council foreign minister since the 2003 U.S-led invasion that toppled the regime of President Saddam Hussein. The Gulf Cooperation Council also includes Bahrain, Kuwait, Oman, Qatar and Saudi Arabia. Prior to al-Nahyan's visit, only Syria and Jordan had sent foreign ministers to Iraq in the post-Saddam Hussein era. The Arab League's secretary-general has also visited. War and the Sunni-Shiite rivalry in Iraq and the Muslim world have slowed the Arab world's re-establishment of diplomatic relations with Iraq. Iraq's mixed population is mostly Arab with some Kurds and Turkmens, and mostly Shiite Muslim, with a Sunni Muslim minority. Most Arab countries -- including the UAE -- are Sunni-ruled. Iraq's government is Shiite-dominated and it is forging a close relationship with its neighbor, the non-Arab Shiite nation of Iran -- a development that concerns Arab nations wary of Iran's Islamic Republic government. Al-Maliki's government is seeking to develop close ties to all countries of the region. CNN's Caroline Faraj in Dubai and Mohammed Tawfeeq in Baghdad contributed to this report.